This entry was posted on July 4, 2012 at 10:59 pm	and is filed under Ceremonies & Celebrations. 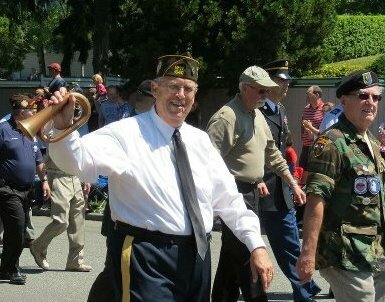 Tagged: bugle, bugler, Edmonds, Independence Day, Lynnwood, parade, veterans, VFW Post 1040. You can follow any responses to this entry through the RSS 2.0 feed. You can leave a response, or trackback from your own site. It was a great parade and small-town experience, though I would have liked some military marching bands. Still, the local high school kids did great! Yes, I wonder where the military bands were…somewhere in Everett and Seattle, I suppose. I love the marches they play. They add so much to a parade!